The Lord says: My son, hear my warning now! Shout out an alarm for enemies are at the gates! Because my people have been blinded for so long and have refused to hear my words of warning from my prophets and watchmen, sudden destruction will come upon the land. The day will come when your enemy will be strong to the north and to the south and will take the land suddenly. America will be compassed about by her enemies. 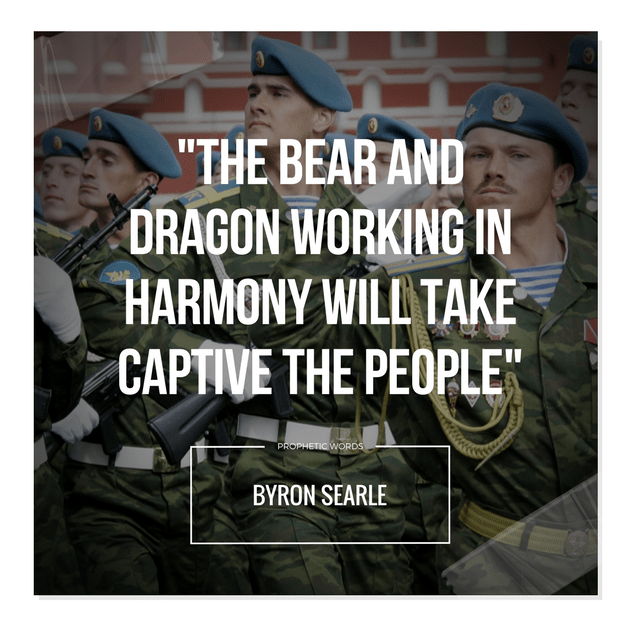 The bear and dragon working in harmony will take captive the people. My son, because my people are so blind to this coming attack, many will say, “How could this have happened to a great nation?” But I say because of the sin of this nation and a prideful, arrogant people, I will hold nothing back. Destruction will be quick, and many will perish. My son, had my people just listened to my warnings, they would have been ready. But, as before, my people have missed their visitation. My son, I told you before that when the judgments start, it will be too late, for the events will occur one after another. So great the destruction will be, that the whole world laments for America. But all is not lost, for during this time My Spirit will pour out across this once great land for a mighty harvest! Many people will come to me and be saved. This nation will burn with the fire of the Holy Spirit, then I will get my bride. Great will be the Word in America! Young people will lead the masses to victory! My Remnant will be strong! What a glorious time! My son, even though death and destruction will be everywhere, so will My Spirit and so will My Bride, washed in the the fire of revival and My Blood! Be ready, My Bride, for perilous times are upon you! Stay in My Word and on your knees. I will give you peace and comfort. My son, share this Good News. Jer.14:13-16 The Lord says, My son, the liars have taken the house, the land, and the people. Liars are saying things using My Holy Name and twisting My Holy Word. My son, people want to know what is going to come and how bad things will get. Tell them to read My Word, for I have held nothing back, and everything that will come is written in My Word. My son, the people don’t want to know WHAT is coming, but WHEN is it coming. When will the earthquakes start? When will the asteroids hit? When will the tidal waves strike? And when will the wars start? But I say to you, They have already begun! Oh, but you say, My people, when will the Gathering happen? When will the seals be broken? When will the end come? But I say unto you, When will you humble yourself and repent? Many false prophets are throughout the world. Did I not tell you this is a sign? Read My Word! Jeremiah, my servant, had the same situations. While he was warning the children of the coming doom, he was laughed at and called a false prophet. Meanwhile, the false prophets were saying there will be peace, not the sword, and there will be plenty, not a famine. All My children followed the lying words of the false prophets and either all starved, died, ate their children, or were taken captive.My true prophet Jeremiah warned them time after time. I, the Lord, allowed them 20 years to repent, for my mercy and long-suffering was toward them. My son, this day many false prophets are proclaiming the same things said in Jeremiah’s day. But I say to prepare, for the time is now here that has been spoken of for 40 years by my faithful prophets. Jeremiah wept for the children of Israel just as you have wept for the children of America. Be ready for the Gathering, be ready for the judgments, be ready and have your house in order. You say when? I say now! says the Lord God of Heaven’s hosts. I am coming for My Bride very soon! Be ready! !